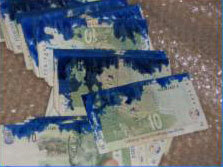 Protect your banknotes by staining them when attacked. Stained money is illegal tender. Positively identify your stained banknotes with DAD's finger print. The finger print in dye can be detected electronically. Stain money inside a Tamper Evident Security Bag, without loss of features.